(Pic: Evgenia Argubaeva) Those of who work with reindeer as herders, researchers, and people in areas of reindeer husbandry obviously think about reindeer much of the time. As a species they are the cornerstone of life in the Arctic and nearly 30 different indigenous peoples in the northern hemisphere. Not so for the rest of the world whose interest in reindeer is very seasonal. 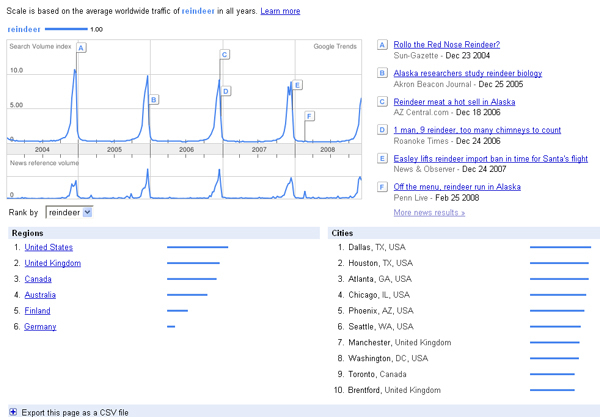 At Christmas time, global interest in reindeer soars (see the Google trends graph below). Reindeer and people have an ancient attachment. There are archaeological remains and cave paintings in France and Spain from the end of the Pleistocene, 11000-17000 years ago that have led some to call that period the 'Age of the reindeer'. In the North, the age of the reindeer (Rangifer tarandus) continues much as it has done for thousands of years. Reindeer are not endangered - there are as many as 3 million wild and 2 million domesticated reindeer around the North, with most being in northern Russia. There are also large herds of wild reindeer / caribou both in Russia and North America. There are even reindeer on Greenland, Iceland and the isolated islands of Svalbard. Over time reindeer have shown themselves to be phenomenally adaptable and uniquely designed to handle extreme fluctuation in temperature. Today they lives in regions that range from -70 C to +40 C.In the 20th Century, 'Santa Claus' has become associated with his team of reindeer flying through the northern sky with a sledge laden with gifts. As with many contemporary myths, the story is a mixture of fact and fiction with a heavy dose of commercialism. 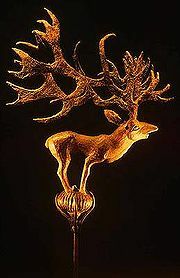 Reindeer have actually been associated with flying for millennia. 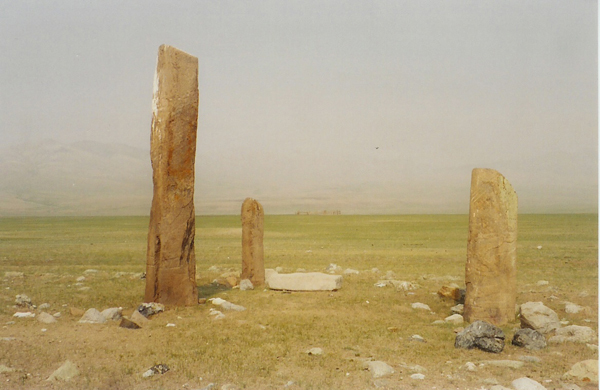 In the steppe and desert of Mongolia and into the Altai mountains, you can find 'reindeer stones' that are at least 3000 years old. These standing stones are carvings placed above burial sites and reindeer, flying, with elongated antlers being their most common motif. The Pazyryk people, an ancient nomadic peoples of the Altai mountains are best known for the elaborate tattoos that have been found on their mummified remains. Flying reindeer again are clearly visible. St. Nicholas was a 4th Century bishop of Myra (present day Demre in Turkey) who was know for giving presents to poor children. Under the name of Santa Claus, Dutch immigrants brought him in their stories to New York. He was first associated with reindeer in the poem "T'was the night before Christmas", published in 1823 and written by Clement Clarke Moore (1779 - 1863). So were born Santa Claus' 8 reindeer (Full poem here). The ninth, Rudolf, the best known reindeer of all, was added in 1939 by an advertising copywriter. 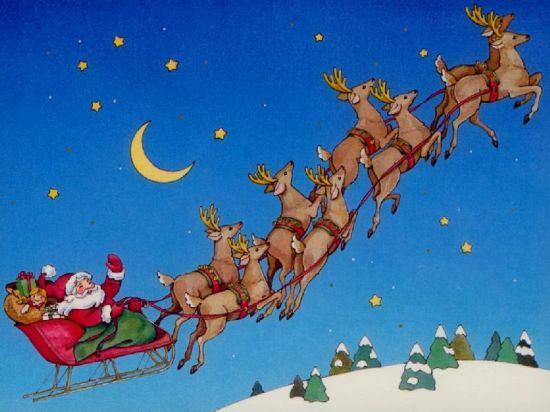 The story of the commercial connection between reindeer and Santa Claus has a Sami connection. On February 28th, 1898, 113 reindeer herders - men, women and children from Kautokeino and Karasjok in Norway, 539 draft reindeer, 418 sleds, a number of dogs and lichen arrived in New York after a long and arduous ocean crossing from Bossekop, near Alta on the Finnmark coast. The ship they sailed in was called the 'Manitoba', hence the name “The Manitoba Expedition.” The herders and reindeer crossed the U.S. by train and after a series of mishaps, made their way to Alaska, heralding the introduction of Sami reindeer husbandry to North America. The goal of the so called 'Reindeer Project’, was a US government plan (led by a dynamic missionary Sheldon Jackson) for Sami to teach Inuit how to herd reindeer. Reindeer numbers grew rapidly in Alaska, becoming a reliable source of meat and even delivering mail for the U.S. Postal service. Reindeer numbers grew exponentially in Alaska and by the 1920's, there were well over 100,000. In business circles there was even a 'Reindeer King', Carl Lomen a US businesman, and it was he who can be credited with establishing the consumerist and commercial version of Santa Claus and his reindeer. North American commercial giants Coca Cola and Walt Disney used reindeer in their advertising campaigns, solidifying the connection between reindeer, Santa Claus and the North Pole. With the growing interest in pre Christian religions, there is a great deal of material circulating connecting flying reindeer with shamanic usage by indigenous peoples such as the Koryak of the mushroom Amanita muscaria (fly agaric). Koryak are a reindeer herding people, but much of this material is fanciful and inaccurate. Now many countries vie for the ownership of Santa Claus, including Finland, Norway and Greenland. Finland would appear to have the mass market Santa Claus locked down with a sprawling Santa Claus theme park north of the town of Rovaniemi, on the Arctic Circle. 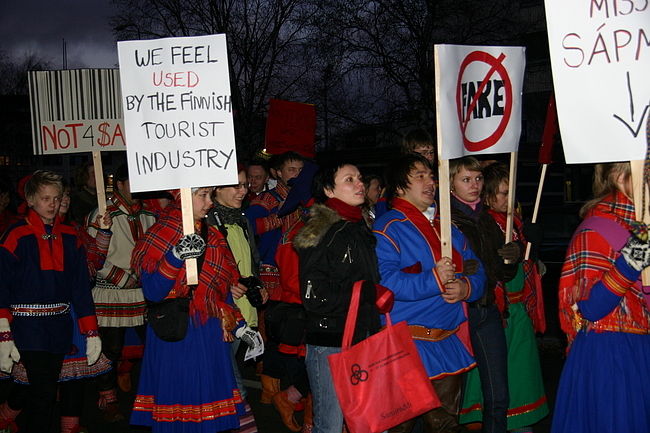 Finnish marketing techniques have explicitly made a connection between the Sami people as Santa's helpers. Since its establishment in the 1990's, Finns dressed in fake Sami clothing have been a fixture in Rovaniemi and beyond, sparking a burgeoning market for fake Sami clothing, handicrafts and dolls. 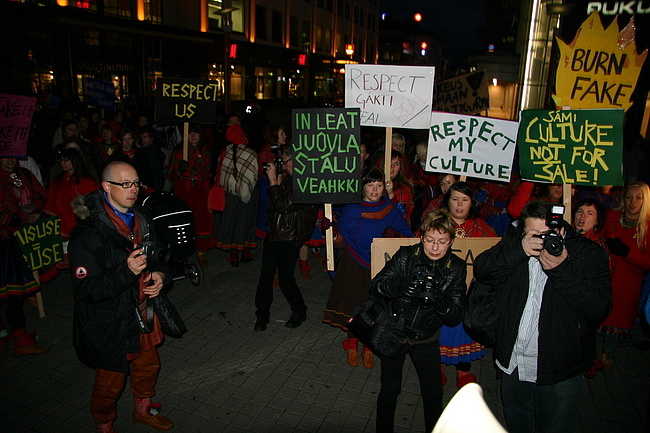 This has been a source of contention, culminating this year in a protest by Sami youth in Rovaniemi, against cultural appropriation as practiced by the Santa Claus tourist industry. 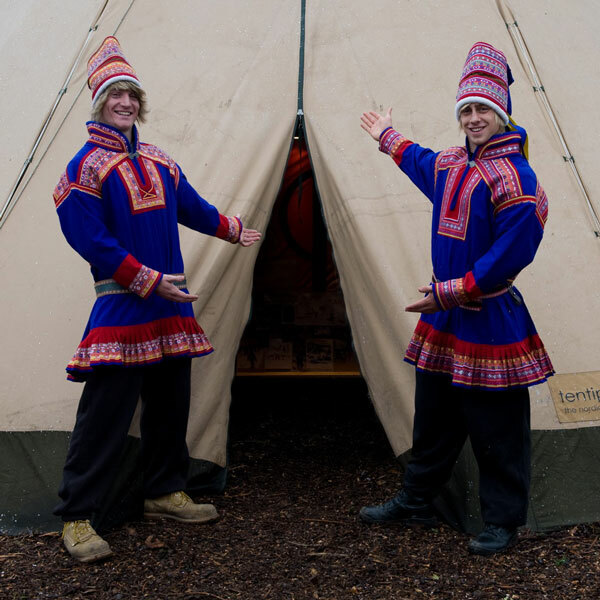 The 'fake' Sami costumes and Santa Claus connection has even spread to the UK, where a number of Christmas theme parks have sprung up, some with mixed success. Reindeer, or rather the eating of them, have been the target of a well timed media release this year by a large UK based vegetarian activist organisation against IKEA selling reindeer sausage. 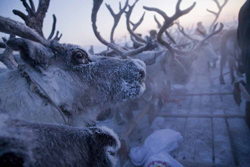 Reindeer herders remain at or near the bottom of the salary scales of all the countries in which they are resident. 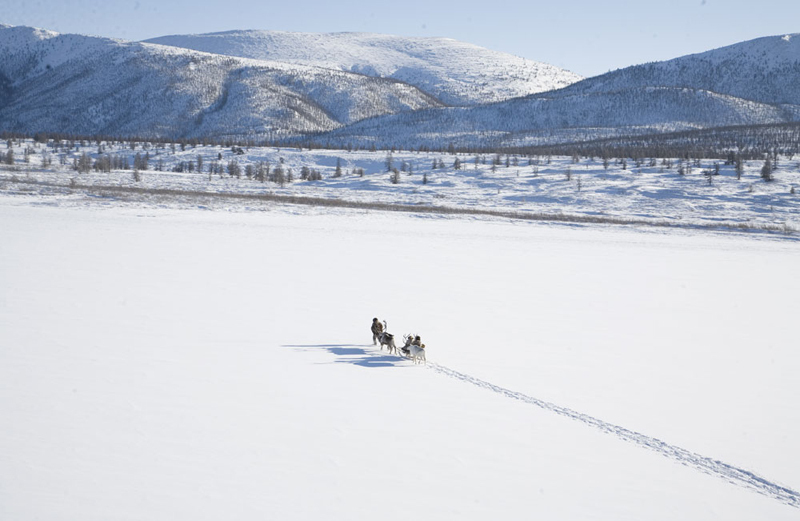 This has prompted one US based foundation that works with Tsataan reindeer herders in Mongolia to launch an Adopt a Reindeer seasonal appeal to assist the work of their foundation in this region of taiga reindeer husbandry, which persists on the margins of the reindeer world in very challenging social and economic conditions. Reindeer, reindeer herders and reindeer husbandry will continue regardless long after the last tinsel is taken down, much as it has done for millenia, in a connection between people and animals that is far, far older than the concept of Christmas. Here's to the reindeer!